An all-star panel of futurists and inventors featuring John Underkoffler, CEO & chief scientist, Oblong Industries; Philip Rosedale, CEO of High Fidelity and founder of virtual world “Second Life;” Berkeley academic Jack McCauley, founder & president of McCauley Labs and a co-founder and chief engineer of Oculus; and Richard Marks, director of PlayStation Magic Lab looked above and beyond the introduction of VR to articulate an array of visions and technical challenges yet to be mastered. 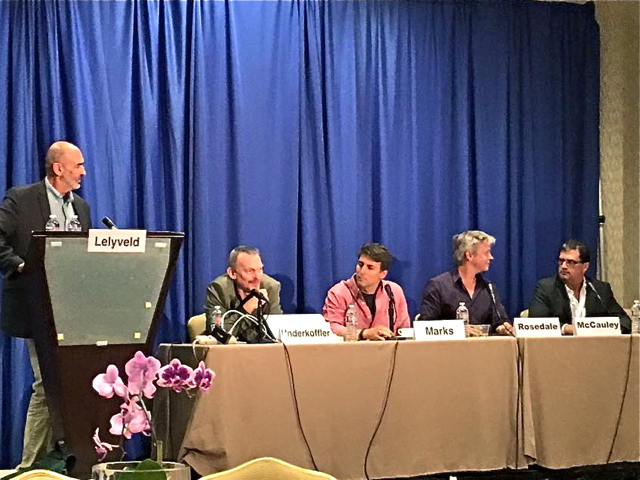 The panel took place at Digital Hollywood and was moderated by ETC project manager Philip Lelyveld. If there was a common theme to emerge among the participants, it was articulated by Richard Marks who summed it up in one word, “value.” If you are going to have the friction of wearing a headset, then the experience must be worth it, he elaborated. The ease of something simple, such as Google Cardboard, permits lower level fidelity because the threshold is low. But the high value opportunity in VR he said, is with the highest possible fidelity, provided the cost and comfort are reasonable. Where the mouse has just two dimensions of movement, the VR interface has the potential for 18 dimensions of free movement — six each for your head and hands. “The real experiences that are genuinely going to be disruptive are going to be the ones where we have agency — where we can reach into the virtual world and do things,” said Rosedale. McCauley wants to “take VR and put it into the hands of everyone by making it less expensive.” He envisions doing so by shifting the computational load off the host PC and potentially onto the headmount. He also cited eye-tracking as vital because eyes only resolve a small area of the field of view. By tracking the eyes, the system could render in high resolution only the pixels where the viewer is looking. “Whether wearing the ‘bucket’ on your head or in a room surrounded by pixels, VR without an input, a UI, is just 360 Cinema,” Underkoffler observed. Nearly all of the panelists noted the importance of hands, both the tracking of their movement as well as their representation on screen. The projection of our hands on our brains is astonishingly strong, which makes the accuracy of their representation critical. The panel concluded with a five-year projection on VR and AR. McCauley recognized advances in mobile devices as a catalyst to the present state of VR. Resolution will improve to the point where you can no longer see pixels, likely with OLED technologies, Magic Leap’s development and the promise of untethered VR and AR. Rosedale suggested that AR will not be viable in five years because registration — the accurate alignment of virtual objects in the real world — will still be a challenge. Overall, he compared this era to the early days of the Internet. Even people who completely embraced the Internet could not imagine its full potential. Video of the panel discussion is now available online.